KINGMAX has been focusing on storage products for a very long time, and focusing on the consumer market to provide consumers with the best products with the best qualities! KINGMAX is pleased to attract praise in the storage product field. And now, in order to serve a wider market, KINGMAX upgraded its existing technologies and invested professional R&D resources to challenge the industrial storage market. KINGMAX currently has received orders from industrial computer, POS system, vehicle electronics and embedded system manufacturers etc., and has already received substantial affirmation on the market. Both wide temperature application and standard models of DRAM modules, industrial memory cards and SSDs have been released so that companies and enterprises can choose according to their usage environments. There are different DRAM module types for different applications, and since KINGMAX had extended operations on storage products, it has accumulated various manufacturing experience and is able to provide customers with excellent products that are highly stable and reliable. eMMC solved the management problem of NAND Flash, and is able to simplify production and compatibility disparity problems for the design of storage solutions of system vendors. Its reliability is better and it is used more and more widely by customers, therefore the eMMC product application needs proposed by customers are also getting wider and wider. As smartphones get smaller and smaller, there is the need for integrating eMMC and DRAM into eMPC etc. KINGMAX is able to design and produce products that meet these special requirements after multi-party discussions with the customers. In order to meet the needs of industrial computers to make the transmission performance smooth and fast, the wide temperature series (-55°C~95°C) may become a basic requirement under specific usage environments; there are multiple capacity selections for customers to choose from according to their actual needs. 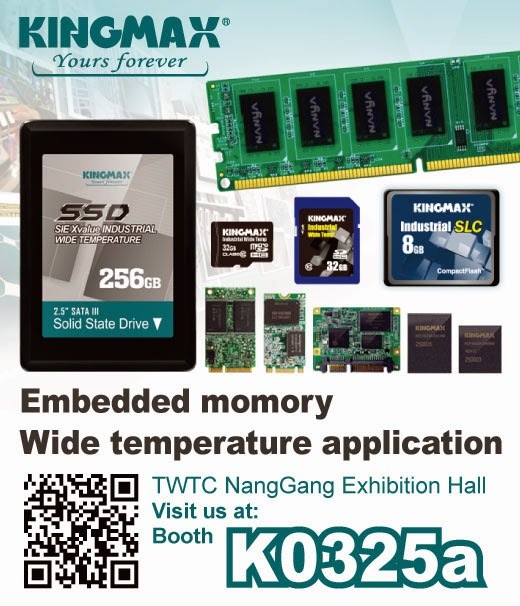 There are new products released for both the wide temperature product series and the embedded memory series in this exhibition. We welcome everybody to visit the KINGMAX booth, booth number: K0325a.